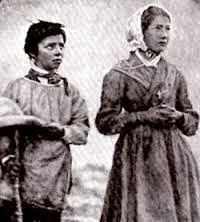 In light of the recent publication of the vision of a colossal flood seen by Sr. Lucia when she was asked by the Blessed Virgin Mary to write down the content of the Third Secret of Fatima, I thought it should be worth revisiting the content of an important earlier post on this subject. The natural causes behind the events of the Exodus has once again been brought into focus by the recent screening of Ridley Scott's controversial take on the history behind this event in his Exodus: Gods and Kings, when he depicted the long theorized drainage of the Sea of Reeds (the most accurate translation above the "Red Sea") being caused by a tsunami. 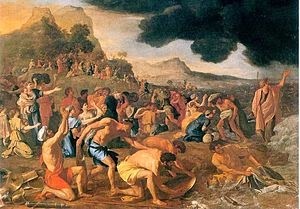 While Scott's version of the causes of some of the other plagues of Exodus is seriously flawed, it is worth taking note that its primary inspiration is taken from a quite convincing theory discussed by many leading theologians that these events were actually caused by the most catastrophic volcanic eruption in human history - that of Thera, Santorini, cicra 1500BC. Given the fact that the Apocalypse bases its imagery of the "huge mountain, burning with fire" being thrown into the sea on the events behind the plagues of Exodus, it prompts us to consider the possibility that the destruction of the eschatological empire referred to as "Babylon" will in turn be caused by yet another record-breaking volcanic eruption. 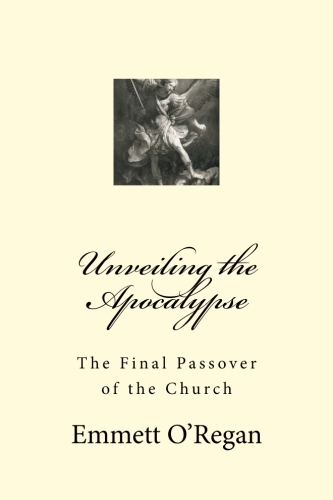 One of the most extraordinary aspects of the Book of Revelation's re-imagining of the story of the Exodus, is that it appears to have been aware that the plagues of Egypt were associated with a "great mountain, burning with fire" being thrown into the sea (Rev 8:8) - millennia before the Santorini/Exodus hypothesis was first postulated in modern biblical scholarship. The theory that the Thera eruption was the source of the plagues described in the Book of Exodus, was first forwarded by the Egyptologist Hans Goedicke during the early 1980's, and has since become one of the most widely accepted explanations for the events of the Exodus in modern biblical scholarship. The eruption of Santorini, which destroyed the Greek island of Thera between 1600-1500 BC, was one of the largest volcanic eruptions in recorded history. 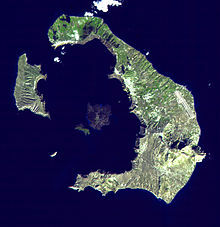 With an estimated value of 7 out of a possible 8 on the Volcanic Explosivity Index (VEI), the Thera eruption brought about the collapse of the Minoan civilisation on the island of Crete, and is thought by many scholars to be the primary inspiration for the myth of Atlantis recounted in Plato's Timaeus and Critias. Satellite image of the Santorini caldera - the remains of the eruption which devastated Thera in the mid-second millennium BC. Whilst the fish in the Nile would have been suffocated by the algae, large swathes of frogs would have been forced out of the waterways, leading to the second plague of Exodus. The frogs would have quickly died without water, and their rotting bodies along with those of the fish in the river would have attracted swarms of flies and gnats/lice, which would be able to proliferate more freely without their natural predators. This then accounts for the third and fourth plagues, and the disease spread by the increase of flies, mosquitoes, etc would have led to the fifth and sixth plagues - boils appearing on livestock and humans. The plague of the hail of fire mixed with ice would have been caused by the fall of the volcanic debris that was ejected into the air during the ongoing eruption at Santorini. Volcanic ash and pumice from the Thera eruption has been discovered at several archaeological sites across Egypt, making it certain that the Egyptians would have been badly affected by this cataclysm. And the plague of locusts has been explained as the mass displacement of these creatures around the Aegean by the ash cloud issuing from Santorini, coupled with the rise in humidity, causing them to descend en masse onto northern Egypt. The ash cloud would then also account for the plague of darkness that swept the land for three days. The deaths of the firstborn during Passover is somewhat more difficult to put down to a scientific explanation, with theories ranging from a poisoning of the food supplies - which the firstborn would have been privileged to above other family members during a period of famine; to ritual human and animal sacrifice. Although it would be a mistake to divorce the events of the Exodus from the miraculous altogether. From a faith-based perspective, it seems best to view these events as a series of cause and effect natural events interspersed with elements of the miraculous, all of which were governed by an overriding supernatural power. 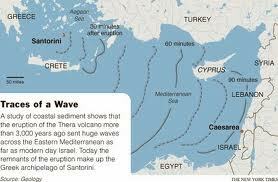 Given that the tsunami waves reached as far as Israel, then it is almost certain that they would also have affected the northern coast of Egypt. There is a modern consensus amongst Old Testament scholars that the usual identification of the Red Sea as that which was crossed by the Israelites during the Exodus was based on a mistranslation of the Hebrew word Yam Suph. A more accurate rendering of this location is the "Sea of Reeds", which given the physical description this name implies, is thought to be a lake located somewhere in the marsh lands of the Nile Delta, near the Mediterranean coast. It has been theorised that the Israelites arrived at the Sea of Reeds just before the tsunami made landfall. The drawback caused by the the swell of the incoming tsunami wave would have emptied large parts of the lake, allowing the Hebrews to cross. While the Israelites reached safe ground, the pursuing Egyptian charioteers would have then been swept away by a wall of water when the tsunami eventually made landfall. The only real problem with attributing the plagues of Egypt to the Santorini eruption is in the dating of the events of the Exodus itself. In 1Kings 6:1, the Bible dates the events of the Exodus to 480 years before the construction of the Temple of Solomon - around 1450 BC, which is very close to the most widely accepted dates for the eruption of Thera as at around 1500 BC. But placing an exact date on the Santorini eruption has been notoriously difficult. A recent radiocarbon dating of an olive tree found inside a lava flow which issued from Santorini, places the date much earlier than that originally thought by archaeologists - at around 1600 BC. But in the wake of the fiasco surrounding the skewed dating of the Shroud of Turin due to the apparent cross contamination of radiocarbon samples, the reliability of this method of dating is far from certain, and even many archaeologists have dismissed these results. One accumulated, the uncertainties surrounding the date of the Thera eruption is felt by many to bolster the feasibility that it coincided with the events of the Exodus. Many modern scholars reject the biblical date given for the events of the Exodus however, as this would place it as taking place during the reign of Pharoh Thutmose III. Since there is no corresponding archaeological evidence or relevant Egyptian records for this regnal period, many biblical scholars have forwarded a later date for the Exodus as having taken place during the reign of Rameses II circa 1260 BC. As an alternative to this late dating, Egyptologist David Rohl recently forwarded a revised Egyptian chronology which would support the biblical date for the Exodus as at around 1450 BC, and in turn meets with an archaeological record which perfectly fits with the events described in the Bible. Rohl's New Chronology theorises that the conventional chronology used by the vast majority of modern Egyptologists has been artificially over extended by around 300 years, placing the events of the Exodus as occurring during the reign of Pharaoh Dudimose. If nothing else, Rohl's New Chronology highlights the imperfections of the conventional Egyptian chronology, and reminds us that even long established models can be subject to paradigm shifts, just as some of the presumptions of Newtonian physics were overturned by Einstein's theory of general relativity. So we can safely conclude that the Book of Revelation bases much of its material on the plagues of Egypt, which rather astonishingly, it appears to have known were centred around a "great mountain, burning with fire" being thrown into the sea. But in its reinterpretation of past events as a reflection of the future, the Apocalypse foretells that a burning mountain being cast into the sea will destroy the eschatological world empire referred to as "Babylon". The main message that seems to be conveyed by these parallels, is that just as the Minoan civilisation (Atlantis? ), and indeed the Egyptian Pharaoh, were undone by a burning mountain being thrown into the sea, so too would Babylon be toppled by the effects of a large scale volcanic collapse. It seems that the events of the Thera eruption is destined to be reenacted in the future. As we have already discussed in the post Mega-tsunami, just such a fate lies in store for America upon the eventual collapse of Cumbre Vieja in the Canary Islands. The ensuing mega-tsunami caused by the collapse of Cumbre Vieja would obliterate the entire east coast of the Americas, including cities such as New York, Boston, Washington D.C. and Miami, as well as the Caribbean islands and various cities on the coast of South America. And a catastrophe on this scale would almost certainly bring about the total economic collapse of the USA - especially if hostile nations exploit this opportunity and deploy certain strategic measures to ensure that it could never recover (such as arming a rogue state to attack key cities on the west coast, or even simply by refusing vital economic aid). "The Holy Father will suffer greatly. I will be at his side to the end in order to receive his sacrifice. The wicked will make several attempts on his life, but they cannot harm him. But neither he nor his successor will live to see the triumph of the Church of God." The original post (found here), was written some time before I happened across the Worthy Shepherd Prophecy prior to the election of Pope Francis, and I had completely forgotten about this portion of the unapproved version of the Secrets of La Salette.